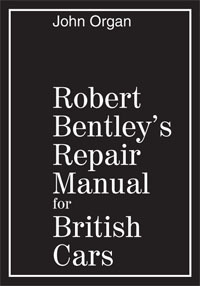 Robert Bentley's Repair Manual for British Cars is illustrated with detailed photographs, technical diagrams and charts. With fourteen chapters covering topics ranging from engine overhaul & reconditioning, curing universal joint failure and solving cooling system problems, this service manual is a vintage reference source of technical automotive repair information for pre-1970 British marque vehicles. "Indeed, a very high percentage of poor-performance complaints prove extremely easy to locate and anyone prepared to spend a little time can reduce the cost of minor adjustments and even major repairs to a few shillings instead of the many pounds which professional labour costs naturally involve." 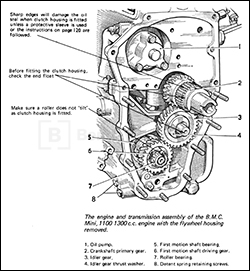 Author "Johnny" Organ brought the extensive practical experience he gained working at the British Motor Company and the BMC Rally Team to Robert Bentley's Repair Manual for British Cars. Originally published in 1970 in the United Kingdom as the Foulis Overhaul Manual for British Cars, this comprehensive repair manual is a classic in the field of British car repair and maintenance guides. Fig. 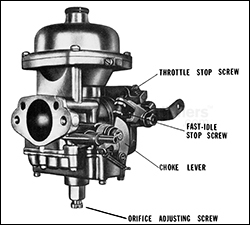 12-24 - The adjustment points on the Stromberg CD carburetter. The Stromberg operates on the same principle as the SU carburetter.